Place bagels in toaster until lightly crusted. Cool 5 minutes. 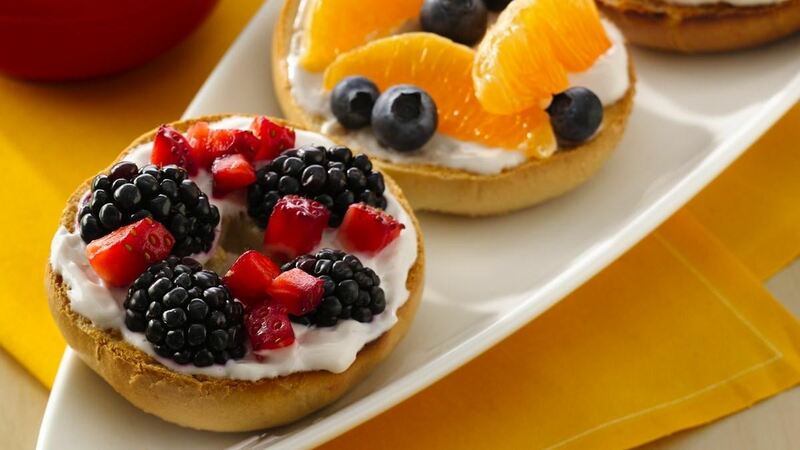 Spoon yogurt on top of each bagel slice. Spoon berries or cut up fruit on top of yogurt. Serve immediately. Variation: These bruschetta are delicious with all kinds of fruit! Try blackberries, blueberries or even oranges for flavour and colour variation. ® Trademarks of YOPLAIT MARQUES S.N.C. (France) used under license. ® Marques déposées de YOPLAIT MARQUES S.N.C. (France) exploitées sous licence. © 2013 Yoplait Canada.